Op het moment dat ik mijn artikel aan het voorbereiden was over Hanbury, kwam er een vriendschapsverzoek binnen op Facebook van Maria Candida Gentile. Een mooi voorbeeld van synchroniciteit. En een geweldige mogelijkheid om haar enkele vragen over haar leven als parfumeur en entrepeneur te stellen. I don’t have a typical working day. I take care not only of the creative part, but also of business, so it’s a very busy day anyway. When I’m working on a perfume, which is the best part of my job, I follow my inspiration, and that makes the day even more unpredictable. Nature. All of my perfumes were inspired by moments spent in a natural environment. For example, Barry Lyndon was inspired by a walk in the Alps, and Sideris by staring at a starry sky in the ligurian Riviera. How long do you work on a perfume? Usually the creative moment is very short, no more than a few hours. I need complete isolation when that happens, then I get away from it and do other things. After that the inspiration comes back, but I never know when that will happen. Sometimes I adjust the perfume for years, and I need a few extra months to test it properly anyway. Does it always start with a clear idea or feeling? Or does the perfume show its character over time? I need both feeling and clarity of mind. I cannot create a perfume without emotions, and the right idea will come along. The perfume’s nature grows over time with the adjustments, but it will never change its character, born with the inspiration. Are you working on a new perfume right now? If yes, can you already tell something about it? Right now I’m working on a seaside perfume. It will be the fragrance of the sea after the rain. I’ve been working on it for a long time. It’s not ready yet because I’m experimenting natural materials to avoid calone, helional and all other chemicals you always find in the aquatic fragrances. You speak on your website about the ‘classic range’ of perfumes. What is a classic perfume in your point of view? Does that mean that you also compose non classic perfumes? By “classic” I mean perfumes structured like the wonderful fragrances that once were the standard in the great French perfumery. My new line, which is called “Exclusive”, is in the same vein but with a different approach. But for that you’ll have to wait until September. Which perfumes or perfumers do you admire? What is an old time favorite for you? Germaine Cellier, who created Vent Vert by Balmain, Bandit and other masterpieces, distinguished herself in times when perfumers were almost exclusively men. I really admire her a lot. Besides her fragrances, another old time favourite of mine is Vivara by Emilio Pucci. The official reissue doesn’t remind the original one a bit, so I made one only for myself. That’s how crazy love can make you. 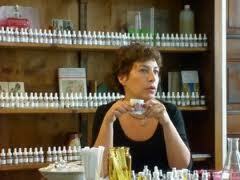 Thanks Maria for showing a sneakpeek in your life as a perfumer. I enjoyed our conversation very much. Aanstaande vrijdag het laatste deel van de drieluik met een artikel over Cinabre. This entry was posted in TOPparfum and tagged Barry Lyndon, Cinabre, Exultat, Gershwin, Hanbury, Maria Candida Gentile, Sideris by Tanja Schell. Bookmark the permalink. Leuk Tanja! Enjoyed reading her answers! Glad to hear you enjoyed it, Guus! Vorig jaar al eens proefjes gekregen bij Dany Diop, maar niet van alle geuren. Als ik binnenkort naar Amsterdam ga, probeer ik (met jouw fantastische plattegrond in de hand) nog wel even bij hem langs te gaan. Ik vond degene die ik heb geroken absoluut verrukkelijk “anders”. Een fantastisch huis, Maria Candida Gentile. Heel eigen, zeer karaktervol. Ben zeer benieuwd naar je ervaringen. Als je wil, laat het me weten! Goed te horen dat The Perfume Shoppingguide behulpzaam is! Wat leuk om het interview te lezen! Ik heb al over haar geuren gehoord maar ze nog nooit geroken. Jou artikelen maken me heel nieuwsgierig – ik ga op zoek naar proefjes. Het zijn zeer karaktervolle geuren, echte liefhebbersparfums. Wat deze parfums extra bijzonder maakt is dat Maria Candida Gentile uitsluitend met natuurlijke grondstoffen werkt.